The effects of burst pipes are often dramatic and devastating, causing property damage and a big mess to deal with. Burst pipes can put you out of your home or business for days, even weeks without the use of your water. West Coast Restoration Inc has been restoring water damaged properties caused by ruptured pipes since 1990, and we are prepared to assist you. 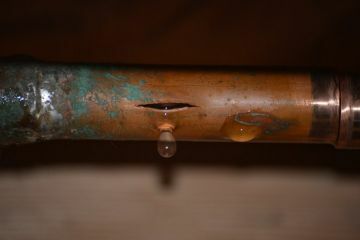 One frequent cause of leaking pipes is plugging. This is caused by build up from mineral deposits, grime or foreign objects that have become lodged. Blockages occur and eventually cause leaking of the pipes. When enough pressure builds, the pipes can burst, and the problems compound from there. Regular maintenance will reduce your changes of build up and leaking pipes. If you do discover that you have a leaking pipe, give us a call at (714) 584-4894 immediately, so we can prevent it from bursting and causing flooding to your property. West Coast Restoration Inc has been providing water damage remediation services to homes and businesses for over 29 years. Our skilled technicians have the experience and necessary equipment to return your property back to normal ASAP. We carry with us the five most needed pieces of equipment to repair pipes that have burst to the job sites: the expander head, pulling rods, a pulling machine, a retaining device, and a hydraulic power pack. Burst pipes must be addressed rapidly so as not to cause major damage to flooring, walls or other items in your home or business. Don’t wait. Call (714) 584-4894 for FAST response.